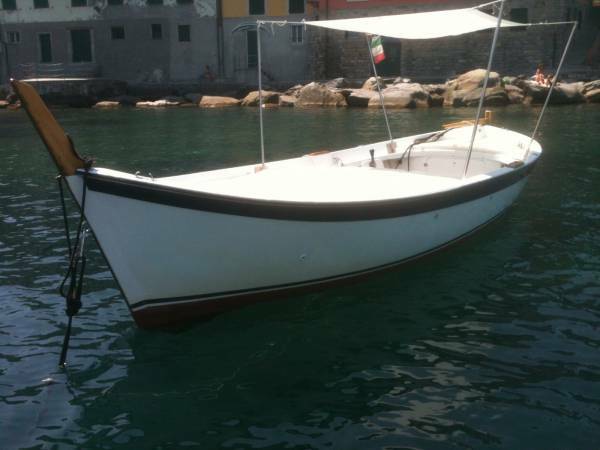 Rent and Lease dinghies, boats and boats in the bay of San Michele di Pagana and in the port of Santa Margherita Ligure with and without license. This is a wooden boat 8,15 meters long. Its engine, Yanmar, has 125-horse power and develops a cruising speed of 12 knots per hour (max speed 14 knots). It has a total capacity of 8 people, (7 cruisers and 1 driver) it is suitable for families and groups of friends for a day trip along Portofino, San Fruttuoso and Camogli or in the opposite direction to Sestri Levante Beach and the Bay of Silence. This boat is equipped with a fixed cover, a large sundeck with cushions on eighty per cent of the surface and a large reservoir of fresh water of about 120 liters. Also located is a wide platform at the stern with a convenient ramp to allow a quick boarding, as well as a space below deck for changing. These will help ensure that the cruisers have an unforgettable day of sun and sea in one of the most charming coasts of Italy. The typical wooden boat with its characteristic shape of the fishermen of Porto Ercole and Punta Ala, make it particularly suitable for short excursions in the tourist resorts of the Tigullio Gulfs and Gulf di Paradiso and in the marine park of Monte di Portofino. Sometimes, for the joy of children, you will be shadowed by pods of dolphins. There are also numerous anchorages in the coves off the coast. In addition, customers can be transported to many characteristic restaurants of the area accessible only by sea. Areas that are a bit farther can take a little more than an hour to reach but thanks to its speed passengers can enjoy the scenery and admire characteristic corners that can be hidden in the Riviera. This Boat is highly requested for its taxi service to and from all the places in Tigullio and of the promontory but is particularly suitable for excursions during the summer sunset for appetizers and drinks. With this structure of the hull and the cruising speed it is not possible to reach the Marine Park of Cinque Terre. The services provided by this vessel are all with the driver and prices are to be considered with the fuel included. This Boat is a GPR, 7.80 meters long and has two outboard motors and four stroke injection.Mercury from 250 horse power develop a cruising speed of 25 knots per hour (max speed 35 knots) and a total capacity of 12 persons (11cruisers and 1 driver). Equipped with a fixed cover, a spacious sun deck, a large covered space, a reservoir of fresh water with about 70 liters, as well as a convenient ladder for climbing aboard. It’s the ideal boat for an unforgettable day of sun and sea in one of the most beautiful coasts of the Mediterranean. These characteristics make it suitable for families and groups of friends to visit tourist resorts closer like the Marine Park of the Monte di Portofino or a bit further like the Marine Park of Cinque Terre; the latter is reachable in about an hour and a half. In addition to seeing the most beautiful resorts on the sea it may be possible to see pods of dolphins and other marine life. Our customers have the possibility to choose which place to stop, if be a private beach club or one of the beautiful coastline coves. Restaurants of the area are often accessible only by sea, which is a great way to experience the characteristic Italian Riviera. Finally it’s the perfect fix for a quick taxi service from and to all the places of the Golf of Tigullio and the Gulf of Paradise. This boat, built in American shipyards, is suitable to face the ocean seas, although we transformed her to visit the coastline for our customers. Fishermen can also request it during the autumn and spring for a relaxing fishing trip. This boat is suitable for catching large fish and also equipped with numerous compartments on its sides for fishing and trolling. This boat also has ample space for maneuvering for fly-fishing or using bolentino outside the mountain of Portofino where frequently we have encountered large shoals of anchovies. Finally, the boat is equipped with tanks for the accommodation of the fish. The boat can be rented without the driver. Prices are to be considered with the fuel excluded or with the driver (excursions in the Marine Park of Portofino or in the marine park of cinque terre) and prices are to be considered with a driver and fuel included. If the first option, driving without driver, is chosen entry or stopping inside the area of the Marine Park of Cinque Terre is not possible, seeing the boat is without authorization. This boat is a GPR 6.50 meters long with an onboard engine, Nanni Diesel, from 40 horse power developing a cruising speed of 5 knots per hour (max speed 8 knots). It has a total capacity of 6 people and is suitable for a quiet day trip along the coasts of the promontory of Portofino, San Fruttuoso and Camogli. Its characteristic shape makes it very safe during the navigation. Its simple guide is particularly suitable for short excursions in the tourist resorts of the promontory and the Gulf of Tigullio. Using simple maneuvering you can anchor in the numerous coves of the area or use the stand buoys of the Marine Park of Portofino Mountain. This vessel is capable of reaching the furthest area of interest, about one hour of navigation. Its speed makes it possible to admire the most characteristic corners and more hidden coves in our splendid Riviera. The boat is equipped with a sundeck, coverage with a removable sole, which can be kept open in motion at cruising speed, a reservoir of fresh water and a convenient platform with a ladder that allows people less agile a simple ascent. Due to safety requirements you must navigate within three miles from the coast. You can tie it up to the buoy at the Marine Park of Portofino Mountain or quickly move away from the coast to shadow pods of dolphins where they can always give you a unique feeling of joy and direct contact with nature that only these mammals have the ability to transmit. Thanks to all this you will spend a wonderful day of sun and sea in the areas of one of the most beautiful coasts of the Mediterranean. Due to the structure, the hull and its cruising speed unfortunately it is not possible to reach the Marine Park of Cinque Terre. Prices are to be considered with Skipper and the fuel included.